I’ve made two delicious taco salads recently. They were really so different that I should refer to them as two different salads – a baa taco salad (because I had lamb in it – get it? 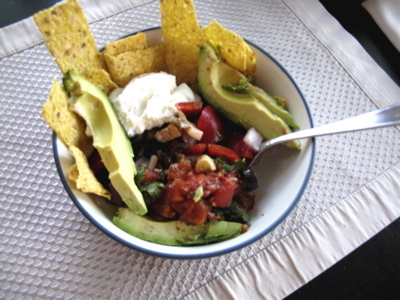 ), and a chicken taco salad. But they were similar enough that I think one post will do. I also have had meat, either lamb or chicken, in my salads, but no meat or a meat substitute would work fine. Combine and enjoy! Like most of my food, this is made on the weekends with the intent to bring it to work during the week, so I generally keep the groups above fairly separate until I’m ready to eat. Particularly the chips, as I wouldn’t want those to get soggy. The nice part about that, too, is when sharing with others, it’s easier to leave out something they don’t like. 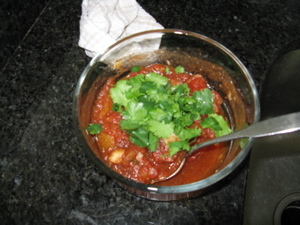 For example, my husband likes this dish, but isn’t a fan of the salsa. 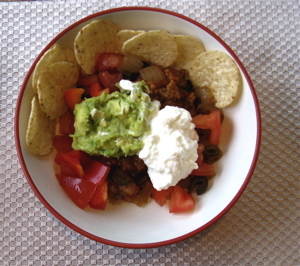 This entry was posted in Dinner, Recipe, Salad and tagged dinner, recipe, taco salad.